Seventeen-year-old Grace Michaels is determined to be thin, even if she dies trying. Part of the in-crowd at Providence High, she is steps away from being asked out by the most desired guy at school, winning a prom queen nomination, and her parents' approval. If she can just get skinny enough, be pretty enough, and popular enough. But Grace is thin on the outside and fat on the inside. No amount of weight-loss ever seems enough. Convinced the melting pounds will solve her problems, every pound lost brings her closer to her goals. But flesh and bone can only hide the weight of her secret for so long. Fans of the emotional and thought-provoking contemporary YA fiction, such as Before I Fall, Tell Me Three Things, and All The Bright Places will fall in love with Souder's heart-wrenching novel, SOMETHING OF SUBSTANCE. A heartbreaking look into a real-life problem. Grace has lived her life feeling as if she wasn't good enough. For her family. For her peers. For boys. After a traumatic event at summer camp, she convinced herself everything would be fixed if she just lost weight. But that was only the beginning. Craving control over her only life, she pushed herself to become thinner and thinner. She becomes a part of the in crowd and even has boy possibilities when it's rumored the most popular senior wants to ask her to prom. But he doesn't see her. Her parents don't see her. The only one who does is the boy next door. Fat, thin, he's never cared. But she does. What if she can't stop before it's too late? Wow, this is a loaded question. 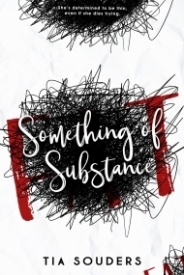 Something of Substance is a special book. A book packed with messages every teenage girl should hear. Just be prepared to cry. I spent the entire second half bawling my eyes out. Grace is the most tragic character I've read in a long time and she was done perfectly. Her insecurities stretched from the page to make me understand her. This isn't a book you read. It's a book you feel. Until I got far into the book and truly connected with Grace, she was a bit much. I almost gave up in the beginning. But I'm beyond glad I didn't. Love. Friendship. Family. Insecurities. A book that showcases the range of emotions suffered by teenage girls. It handles a careful subject with realism and an immense amount of care.